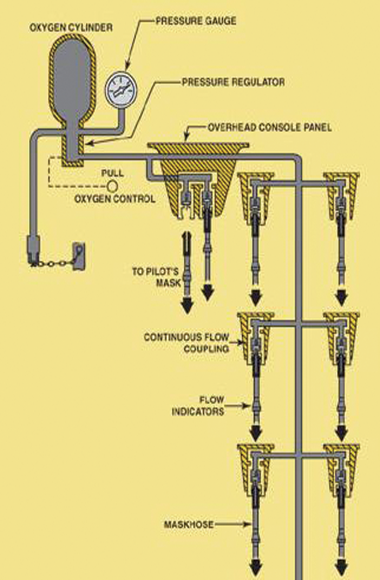 AeroTrain Model AS-40 is a typical oxygen system. The system as illustrated by the shown block diagram. The external filler valve has an orifice that limits the filling rate and is protected with a cap to prevent contamination when the charging line is not connected. The storage cylinder is of an approved type. The shutoff valve on the cylinder is slow opening, requiring several turns of the knob to open or close it, preventing a rapid a change in the flow rate, which could place too much strain on the system or generate too much heat. The pressure regulator reduces the pressure in the cylinder to a pressure that is usable by the masks. The mask couplings are fitted with restricting orifices to meter the amount of oxygen needed at each mask. Each tube to the mask has a flow indicator built into it. This is a colored indicator that is visible when no oxygen is flowing. When oxygen flows, it pushes the indicator out of sight.